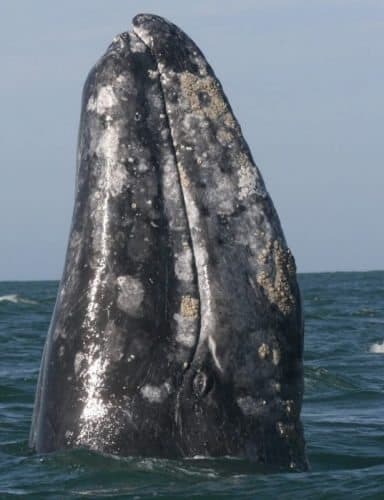 A gray whale spyhopping off the coast of the Channel Islands, in California. 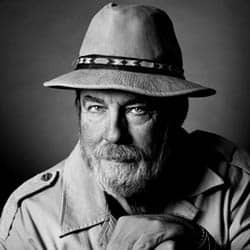 James Dorsey photos. One of the most fascinating national parks in America lays a mere three hours of travel from Los Angeles, and yet nine out of ten people from the city have never been there. It is the least visited national park in the country--the Channel Islands National Park. Entering a sea cave in the Channel Islands, Southern California. The five islands that make up the Channel Islands National Park; Anacapa, Santa Cruz, San Miguel, Santa Rosa, and Santa Barbara, are all technically part of California's Santa Monica mountain range, but were disconnected from the mainland by the Pleistocene Ice Age of approximately one and a half million years ago. There are three additional islands that while part of the chain, remain outside the parks boundaries: Santa Catalina, San Nicolas and San Clemente. The islands were home to the Chumash (Michumash) whose name means "Makers of shell bead money." The people called them in order, Anyapakh, Limuw, Tuqan,Wi'ma, while Santa Barbara Island was mostly occupied by the Gabrieleno people and was named in their tongue. 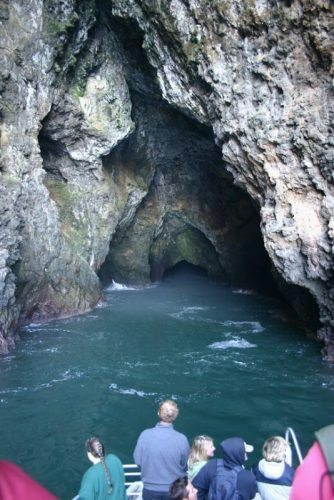 Santa Cruz, the longest island at 24 miles, is home to over 60 sea caves, including the second longest in the world at 1200 feet deep and 120 feet tall, known as "Painted Cave" not because of any man-made decoration, but because of its inherent minerals that give it such varied color. About 18,000 years ago when the sea level was much lower they were all one mountainous island called Santarosae, and evidence suggests they have been inhabited for at least 30,000 years. They have been called "America's Galapagos" because the boundless marine and land based animal population boasts dozens of indigenous creatures found nowhere else on earth. An island fox in the Channel Islands. On the northern most island of San Miguel, artifacts of the Chumash people have been dated back 11,000 years, but the first written accounts of their existence came from Spaniard Juan Cabrillo who first sailed through the islands in 1542, marking the first white contact with native people. Cabrillo called the place Islas San Lucas. For the next two centuries, few explorers visited the islands until the Portola expedition of 1769 claimed them for Spain. Twenty four years later the English Explorer Vancouver gave the islands their current names. The Chumash were known for routinely crossing 30 miles of open waters of the Santa Barbara Channel to trade with the mainland tribes in large open plank canoes call "Tomols" They maintained their traditional lifestyle until the early 1800's when the Spanish decided to "civilize" them, removing most to the mainland for "Missionization" where they quickly died out. Also see: Las Vegas Spas: Why Gamble When You Can Relax? Elephant seals cavorting on the islands. Just before California was passed to the United States in 1848, the Mexican governor first granted Santa Cruz and Santa Rosa to private individuals while the other island became U.S. Processions. They were mostly occupied by squatters, fishermen, and transient sailors, until 1909 when President Taft ordered light houses erected on them for the safety of the growing U.S. maritime fleet. The last permanent light house built in the United States was erected on Anacapa Island in 1932.
in 1980 the islands were designated the Chanel Islands National Park, but Santa Rosa remained privately owned until 1986 when it was sold to the U.S. Government, and in 1987, 75 % of Santa Cruz was donated by its owner, Carey Stanton, to the Nature Conservancy, fearing beaurocratic intrusion would ruin its pristine landscape, and today that much of it remains in their hands while still part of the park system. It is not uncommon for deep water cetaceans such as Sperm and beaked whales to wander through the islands from their home near the Cortez Banks; over 100 miles out to sea to the west, and Great White sharks are spotted with some regularity. Bottlenose, Common, Rizzos and Pacific Whitesided dolphin call these waters home as do the Mola Mola or giant sunfish, colorful jellies, and white sharks, along with more than a thousand species of fish. The Santa Barbara channel has been called "God's Aquarium"
Because of their isolation, many animals that were introduced to the islands long ago by native transport, air flotation and accidental rafting; have evolved into endemic species, sub species, and varietals within species. In 1873 the first remains of a pygmy mammoth were uncovered. It stood from 4-7 feet tall and weighed about 2000 pounds. Many such remains have been unearthed on Santa Rosa and San Miguel islands that suggest they came across on the land bridge before the last ice age, perhaps sometimes using their trunks as snorkels to pass from one island to another as all members of the elephant family are excellent swimmers. 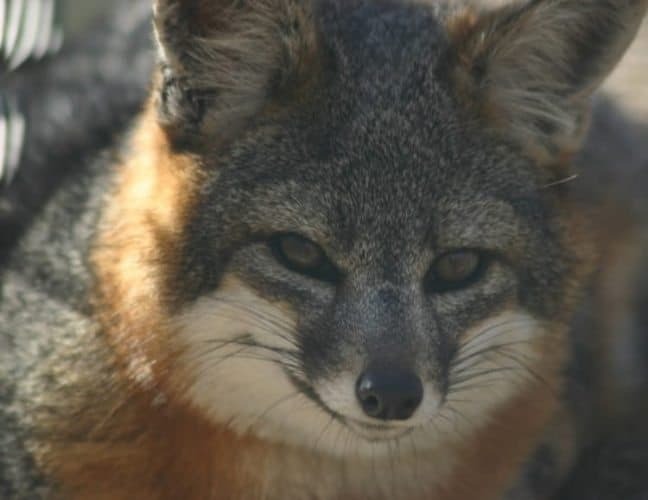 Each island has its own sub species of what was once the Gray Fox, now no larger than a small house cat, each adapted to its individual island. There is also the Channel Islands Spotted skunk that is the size of a baby kitten. These miniature versions of larger land animals have evolved according to the space, and diet afforded by their specific island. Schools of dolphins are common accompaniments to the ferry out to the Channel Islands. In a complete reversal of this trend, on Santa Rosa Island, there is a herd of Elk larger in size than any of their mainland cousins due to a lack of predators and other large animals competing for food. One interesting point is that the most common predator of the mainland coast, the coyote, is not found at all on any of the islands. At point Bennett on the West end of San Miguel one of the largest haul outs of Pinnipeds in the world can be found, with tens of thousands of Elephant Seals, California Sea Lions, Northern Fur Seals, and local harbor Seals, covering miles of beaches at various times of the year. The only other place on earth that contains such a vast population of indigenous and endangered species is the Galapagos Islands of Ecuador. 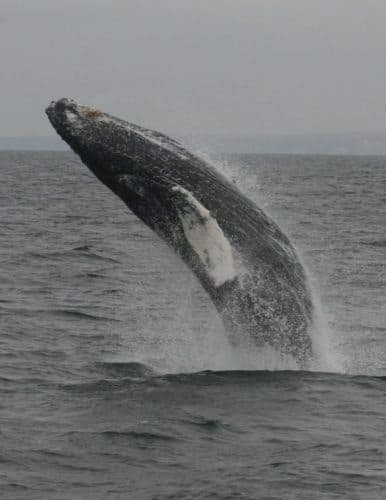 A humpback whale breaches majestically. The Channel Islands are open to the public year round. Most of them maintain developed campsites with bathroom facilities, and all are honeycombed with hiking trails. Because of the low visitor count they are basically pristine. You will find no trash on the trails or graffiti on any buildings. If you look closely, remains of Chumash villages may still be found though they are rapidly disappearing. Visiting them is like taking a step back in time. They are one of the most unique national parks in existence.